Yes, you. The one reading this blog, who just glanced around like I might be talking to someone else. I know you don’t feel beautiful, but you are. So yes, love, you. I saw you reading just now, and you reminded me of myself. I wonder if we could sit down together, eat some ice cream, and maybe you would let me tell you a secret? I want to talk with you about, well, you. You see, when I walked by you, I saw a certain look in your eyes. Oh, other people won’t notice anything wrong; don’t worry. You are beautiful; your clothes are perfect; and your eyes are gorgeous. But I saw something deep and haunting in the wells of your soul. I used to feel alone. I felt separated and alienated, whether there were people around me or not. I felt unloved and unwanted. I used to say, jokingly yet oh-so-truthfully, that I thought God made me to be His celestial joke; as someone for Him to dump on. That’s truly how I felt. I was alone in the world, and fatherless. Spiritually speaking, I was an orphan. Oh, it’s not that I didn’t have a family; there are people on this earth who are related to me. But somehow—you’ll understand this—you can have a family, yet not feel part of a family. You can be loved, yet feel unloved. You can exist, yet never truly live. And I felt alone all the time. I felt unloved, unwanted, and uncared-for. I was terribly bullied by other kids growing up, and I didn’t have much of a support system. I felt like no one believed in me or saw anything valuable or special in me. Nevertheless, I yearned to belong somewhere and to someone! I longed for someone to think I was special. Oh, how I yearned for someone to take me under their wing, love me, protect me, believe in me, and teach me. But I didn’t feel like anyone cared. I felt alone in the world … an orphan. Beautiful one, that’s what I saw in you as I walked by just now. I saw the haunting look in your eyes that tells me you also know the pain of an orphan heart. There could be any number of reasons you feel like an orphan. Maybe you never had a daddy, or never knew your mother. Or, maybe you did—but perhaps your family never poured into you or protected you. Maybe you were bullied at school or abused by a family member, and the special thing in your heart called trust got broken. So you’ve been alone ever since. You are special. You are precious and worthwhile and valuable. And you have a Daddy God in heaven who adores you. I know you feel alone, but you are not alone. I know that many people have let you down. Your family hasn’t been there for you like they should. People who should have supported you failed to believe in you. No one has bothered to stand by your side through thick and thin. But there’s a Bible verse that says, “Although my father and my mother have forsaken me, yet the Lord will take me up [adopt me as His child]” (Psalm 27:10 AMP). And, precious sister, this verse is for you. Because you have a Daddy God who loves you. He loves you so much that He gave up everything He had in exchange for you, including His only Son. He loves you so much that He thinks of you always; showers you with gifts every single day; and spends all His time with you. Somehow, your Daddy God knew you and every single day of your life before you ever even existed on the earth. And one day years ago, He threw you on the womb of your mother so that you could fulfill the assignment on your life at just such a time as this. Your Daddy God has a beautiful destiny for you, dear one. You have a hope and a future. I know things look bleak right now. I see the pain in your heart and the hopelessness in your eyes. I can see that people have disappointed you, hurt you, abandoned you, rejected you, and betrayed you. But despite all these things, beloved, YOU matter. Yes, you. YOU are separated–set apart—unto your Daddy God Himself. You are His. Jesus Christ, the Wonderful Counselor, Mighty God, and Everlasting Father yearns for you with a jealous love. He desires you to be His. He wants you. THIS is the truth that rescued me from the pain of orphanhood, years ago. You see, I used to feel just like you feel right now. I also had nowhere to turn and no one to turn to. I was fighting depression, suicidal thoughts, hopelessness, and fear. But one day, I decided to lay my little life down at the feet of Jesus and let Him have it for whatever it was worth. I certainly didn’t think I was worth very much, but I gave Him the gift of myself for whatever He could make of it. I simply told Him that I had to have Him in exchange. And at that moment, I became His. He adopted me. That very day, I decided that I was going to take Him at His Word and let Him be my Daddy, my Friend, and my Bridegroom. I decided to chase Him hard and allow Him to fulfill—no, insist that He fulfill His promises in my life. I had no one else, you see. So I threw myself at a Man—the Man of Sorrows, Jesus Christ. I threw myself at the feet of my Savior. And I began to seek Him. I sought Him hour after hour, day after day, and year after year. I refused to relent in my pursuit of this Man. Seeking to know Jesus was hard at first. I had no appetite for spiritual things. Even forcing myself to spend five minutes alone with God, reading my Bible and praying, seemed like a huge challenge–and a huge accomplishment when it was over! But remember, I had no one else to take care of me. So in my desperation, I depended on Jesus. I asked Him to be everything to me. I begged Him to help me learn to know Him like the real Person He is, and He did. And as I sought Him and learned to love Him—and, more importantly, learned how much He loves me—He healed my orphan heart. It took time, but He healed me from the betrayal I had endured all my life. He healed me from the hurt of being abandoned and rejected by so many people. He set me free from fear and panic attacks, and He filled me with His perfect love for myself, for Him, and for others. He delivered me from hopelessness and thoughts of suicide, and He filled me with His Spirit, power, and victory instead. Dear beauty, Daddy God wants to do the same for you too. And He will, if you let Him. What do you have to do? It’s simple. Not easy, but simple. All you have to do is throw yourself at a Man—this Man, Christ Jesus. And when you do, you’ll find that He is worth the sacrifice. He’s perfect and excellent in every way. He’ll never let you down. He will always listen to you, and He’ll actually care about what you say. Jesus will always be with you and never abandon you. He will always love you; He’ll never reject you. He will always speak words of life, hope, and encouragement into your heart. He will never pick on you, stop believing in you, or betray you. If you will throw yourself at this Man, Jesus Christ, He will pick you up and hide you under His wings. He’ll shelter you and keep you safe from the world. He will teach you, help you, and heal you from all the hurt you’ve ever experienced. He’ll hug and kiss you when you cry, and He’ll laugh with you when you laugh. Oh, how Jesus loves you, precious. His heart beats for you. So will you do it? Are you willing to lay your little life down at His feet? Will you throw yourself at a Man—the Son of Man, Christ Jesus? Will you give your all for Him, knowing that you will receive so much more from simply knowing Him than you could ever give? I know you’re hurting, beauty. But hear me when I say this: you do have a purpose. Your heart can find its song again. Your life isn’t over. You have a Daddy in Heaven who wants to make all things new for you. He will restore you, heal your heart, and be your Father in every way. Heavenly Father God, I come to You in Jesus’ name. Father, I don’t know You very well yet, but I want to know You. I have nothing to give You except my life, and even that is tattered and torn. But Father, and Lord Jesus, I choose to lay my little life down at Your feet right now. I give myself fully to You. Father, please forgive me of all my sins. Wash me in the blood of Jesus who died for me. Change me. Make me like You, and have me completely for Yourself. Be my Father, my Boss, my Protector, and the Love of my life. Please be everything to me. Heal my heart and make my life new again. Father, from this day on, I choose to throw myself at a Man—Your Son, Jesus Christ. Please help me to seek Jesus and get to know Him. Fill me with Your Holy Spirit. Lead me and teach me. Hide me under the shadow of Your wings, and let my life be a sweet offering to You. Thank You for hearing my prayer. I ask these things in Jesus’ name. Amen. Beloved reader, there is so much hope for you in Christ Jesus. If this letter spoke to your heart today, would you leave a comment below and let me know? Thank you. I thank God for your ministry. Thank you for allowing God to use you in such a mighty way. These words spoke to me VERY personally today. May God continue to bless you! Sharon, thank you. I’m so glad our Daddy God blessed you. May He continue to comfort and heal your heart daily! Thank you so much…I can completely relate…and I do need my heart healed of deep betrayal and wounds and anger. I feel isolated from my family, and my circle is small. I pray for some genuine God friends to come into my life. Most of all I pray for a complete God encounter…a deep encounter with Holy Spirit where I’m never the same and for total transformation in my life. Thank you so much for writing this. It touched my heart deeply. God bless you! 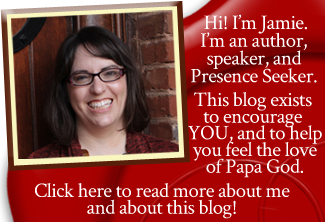 Thank you so much for reading and sharing, Paula! Blessings to you! Amen, Beth. I’m so glad. I pray Daddy God would give you more hunger and thirst for Jesus than ever before, as you throw yourself at Him. I know He will minister to you and comfort your heart. Thank you for your obedience, Jamie. This truly blessed me..I look forward to sharing a praise report behind this prayer. Jaime, I do have tears right now. What a wonderful word for me. I used to say I was invisible. I was a writer and nobody”got that”. I got picked on, too. I’m certain everyone has. I have always loved and sought Jesus, throwing myself at Him as you say. It hurts to have an orphaned heart. As I prayed this morning, I was in a lot of pain. I’m letting go of all those old wounds, I heard Him whisper, the Prince of Peace reigns/rains on you. Thank you for blessing me with these words. Wow, Rebecca, that is absolutely amazing what He said to you. Precious Holy Spirit! I’m so sorry you’ve been hurting, but I know Daddy God can and will heal your broken heart because He has healed mine. I will pray for you this morning. If you’re not familiar with him, you may really be encouraged by listening to Leif Hetland talk about healing the orphan spirit. He has a WONDERFUL book, “Healing the Orphan Spirit,” that was instrumental in my life, which the Holy Spirit used to heal me for the final time and in the deepest measure. Thank you for reading, and for sharing your story with me. I pray you’d have a wonderful day today, and that the Holy Spirit would minister to you and the angels from Heaven would carry the blessings from Daddy God right to you today. Thanks for this, Jamie. Was the exact subject I had been focusing on in prayer yesterday and was just what my heart needed to hear! I’m so glad, Jennifer. Thank you for letting me know! May you sense His love and affection today more than ever!!! Thank you! It’s just like Him to lead me to this particular post on this particular day and moment. He knows our hearts and what we need even if we don’t. As I read this article tears streamed down my face from beginning to end and though I’ve been born again for many years, I read and prayed the prayer. Because of this article I was able to verbalized my own personal feelings to Daddy God. Thank you for being obedient to the Holy Spirit. Oh I’m so glad He touched you, Rebecca. He loves you so very, very much, and I am thrilled that He ministered to your heart. He will do that always!!! You’re His beloved and His song of songs! Thank you for helping me see me how our Father in heaven see’s me even when I have been wronged and been the one doing the wrong. I was betrayed as a child and in my relationship and I let that betrayal and bitterness eat me and I took revenge which led to me betraying my husband as i let the enemy have a foothold in my life for a couple months last year. I have confessed to my husband my wrong doing and now we are trying to repair and I am trying not to hate myself. I have repented and know the Lord see’s my true heart and now I just need my husband to see my true heart, but I thank you for sharing this and reminding me of how my daddy God in heaven see’s me. THANK YOU and MANY BLESSINGS TO YOU! Daddy God loves you very much, Brooke, and I pray He would continue to restore your life today. May you have courage and grace in all things as you humble yourself before Him and seek Him. Remember every moment … He loves you, He loves you, He loves you! Thank you for reading and for sharing. I’m so glad this post blessed you. Have a wonderful day! I hurt all the time. Alk the things you mentioned above happened to me ans more. Rapes, abuse abandonment time and time again going all the way back to age 3. I am unable to talk to my Father God. I dont know why its so hard, i pray in public just fine but in private I. Just. Sit ther. I want to go home. I am so lonly and i HAVe no one. I am a man thay has become a hermit. I dont leave the house any more. I haven’t for years now. Joe, I am so sorry. You left this comment nearly a year ago and I somehow missed it. I humbly apologize. I am sorry you have been through those awful things. The Leif Hetland video I shared above in the comment reply to Rebecca may be quite a bit of encouragement to you, if you haven’t already seen it. I will pray for you today. Thank you so much for the letter. I’ve been abandoned, rejected, hurt, emotionally abused and ridiculed by the one and only person who suppose to love me, care and protect me. My husband is cheating on me and it’s hurts me so much. Sometimes I ask myself why me. But I don’t have to be depressed and be discouraged. I want Jessica in my life. I need to give up everything I have in order to have him. I’m desperate for his love, I want my life to be restored again. I need peace love, joy and happiness in my life. I feel blessed after reading your letter. Thank you so much. May the Almighty God continue to bless your beautiful soul. Rhandzu, I’m so sorry you are going through that. But I want to encourage you today to know that even Jesus did not trust Himself to humans–He knew what was in them. 🙁 But He looked to our Heavenly Father, and that is what you can do right now also. Even though those people who should have been trustworthy and taken care of you have failed you, Father God is waiting for you right now with open arms of love. And HE will never fail you. He will never let you down. And if you will collapse in His arms right now and just stay there, He can and will hold you tight and protect you and keep you as you walk through this. He will heal your heart and help you all along the way. And He will give you a new life that is better than things ever were before. That’s His way. He does it because He loves you so very, very much. Much love and big hugs to you today, sister. May the God of all comfort minister His comfort, love, and encouragement to you this very day. Sorry I meant to say I need Jesus in my life not Jessica. I started weeping when I read the title and the flood gates opened wider the more I read the post. My heart healed just a bit knowing that I am not alone in feeling this way and knowing that God has not forsaken me. And being given hope that in time I shall know his loving embrace.